tumbleweeds rolling through my backyard. wind chimes blowing. no sound of pickles’ name tags clinking. sweet bear…pickles is at day care. cody bear definitely looked less enthusiastic at lunch. meanwhile, pickles is playing her heart out at day care. that’s ok, cody bear has been sick all week, so he probably needs the rest. anyway….gosh everyone. i’m so sorry i haven’t blogged in a while. pickles is missing from lunch and goodbear is missing from blogville. we’ve been really busy. cool stuff has happened to blog about, but it seems so long ago. i guess the big news is….well, pickles is going to be one year old on sunday. we’re having a party tomorrow. yes, i AM being serious. i’ll blog more tonight. give you the details on miss pickles’ birthday extravaganza. once again, sorry it’s been so long. i know some of you have missed seeing my little furpods. they’re fine. cody bear over did it, so he’s a little queazy, but they’re both still hell on paws! thanks for the quackers new york nikki! those toys are soooo last season. 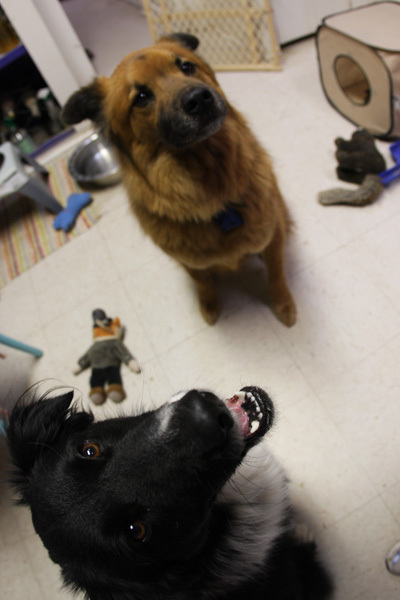 doesn’t it look like these two are on the catwalk modeling the latest new dog toys? “mmmm catwalk. that sounds delicious.” says cody bear. work it! work it! sell that toy. wait a minute! those are LAST season’s dog toys! ever the nature lovers, cody bear and pickles have taken a stick and made it their favorite backyard toy. simply carrying the stick will some how make you run faster. this earth friendly dog toy has no chemicals, no lead paint, and no brigade of youthful exploited workers had anything to do with it’s manufacture. now, the negatives to this dog toy: it doesn’t bounce and it doesn’t squeak. it is, however, small enough that they won’t jam into something and hurt their mouths. running with sticks is dangerous, as is chewing them. but these dogs play responsibly…and they cherish it. and it was free.